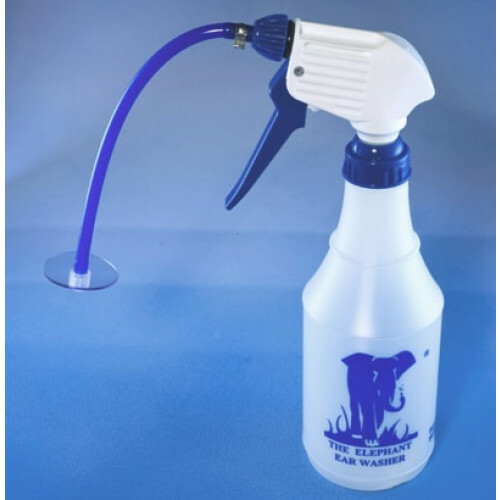 The Elephant Ear Wash System is a highly effective ear cleaner. The wash system works by flushing out hard to reach residue from stubborn areas. Many people who have used this cleaning system have stated their reasons for the use which can be anywhere from constant ear infections to narrow ear canals making it hard for ear swabs to get through. Those who work in dust/dirt filled environments or construction sites will understand the need for such ear cleaners. A cotton swab just will not do, and directly flushing out dirt is the only way to hear clearly again. 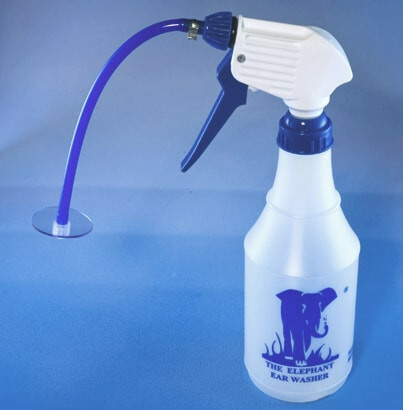 The long hose of the Elephant is flexible enough to be operated by a single user. The provided soft tip will guide the solution you use in your bottle, right into the ear canal. When the trigger is squeezed, the water will enter into the ear and run out, flushing its content. Sometimes water may backsplash if a person is helping you apply treatment - the splash guard will stop water from splashing back out, keeping things clean. If you are are looking for a fully, battery operational cleansing system, you may be interested in the OtoClear Replacement Tips.